In the second decade of the 21st century, anyone can produce a video from the comfort of their own home because webcams and video editing software have never been more affordable. The rising popularity of tutorials, explainer videos, video presentations or gaming videos is partially related to the growing accessibility of the tools required for the production of high-quality webcam videos that can be easily shared online. If you would like to learn how to record, edit and share your videos online you are at the right place because in this article we are going to take you through all the steps necessary to accomplish this goal. Most modern laptops are equipped with a built-in webcam, but the quality of these webcams depends on the laptop model you have. If you would like to make sure that your webcam videos are always captured in the best quality possible, then you should consider purchasing an external webcam. However, before you reach the decision which webcam model you want to buy there are a few things you should take into consideration. The quality of the video you'll be able to create depends on the maximum resolution your webcam can produce. If video quality is really important to you, our advice is to acquire a webcam that can create a video in 1280X960P resolution or higher. Frame rate ensures that your videos will always look smooth and that's the reason why your webcam should produce at least 25 frames per second. Furthermore, the sound quality is as important as video quality, which is why you should make sure that your webcam has a built-in microphone capable of capturing clear high-quality sound or you should external microphone is necessary. The connection options the webcam of your choice offers should play a part in your decision-making process, especially if you intend to create webcam videos from a desktop computer. Features such as mounting options or auto zoom should also be considered before purchasing a webcam. Users in need of a high-quality webcam capable of remarkable performances should try using Logitech 4K pro webcam designed for video conferencing, video recording or streaming. This Logitech's model comes equipped with 4K UHD video recording option, built-in mic, background replacement feature and numerous other options that make webcam video recording look simple. On the other hand, if you are looking for a more affordable webcam then Microsoft LifeCam HD 3000 is a near perfect choice for you. This device will enable you to capture HD videos and post them to any of the video sharing online platforms effortlessly. Unlike conventional videos, most webcam videos are recorded from a single camera position. You should place the camera at the straight angle since this type of camera position is frequently used in tutorials, software walkthroughs or gaming videos. However, if you choose a low-angle or a high-angle shot, make sure that the subject of the shot is placed at the very center of the frame. The importance of good lighting in a webcam video is often overlooked. Although using professional lighting equipment during a webcam video production may not be necessary, it is still important that a person or objects in the video are properly lit. You can combine atmospheric sources of light with artificial ones such as common lamps or LED spotlights. Most webcams of the latest generation have a built-in microphone, but if you would like to be sure that your voiceover is impeccable, we suggest using an external shotgun microphone. This type of microphone rejects atmospheric noises from 30 degrees on both sides, while perfectly capturing the sounds coming directly from the front. A large number of Mac and Windows computer models feature built-in software that enables its users to record video from a webcam, but these programs offer a limited amount of video recording and video editing options. Furthermore, Logitech's video recording software can be used if you own a Logitech's webcam, however, it is best if you use the software that grants you full creative freedom during the process of producing a webcam video. 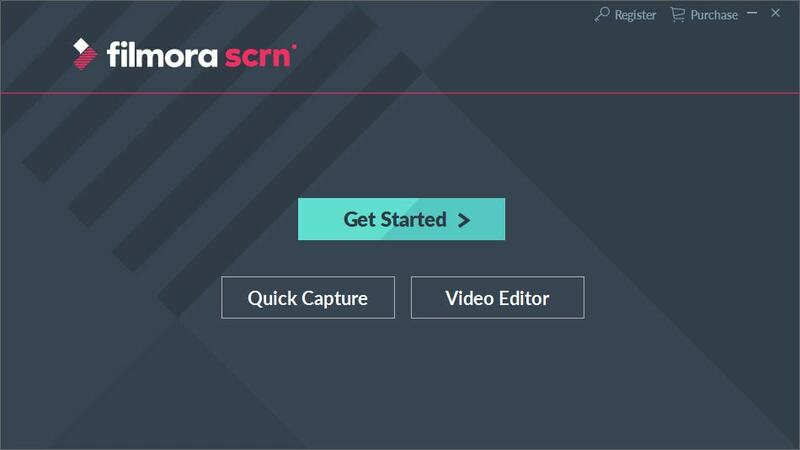 Wondershare's Filmora Scrn screen capturing software is a powerful and yet affordable computer program that allows its users to create high-quality webcam videos. 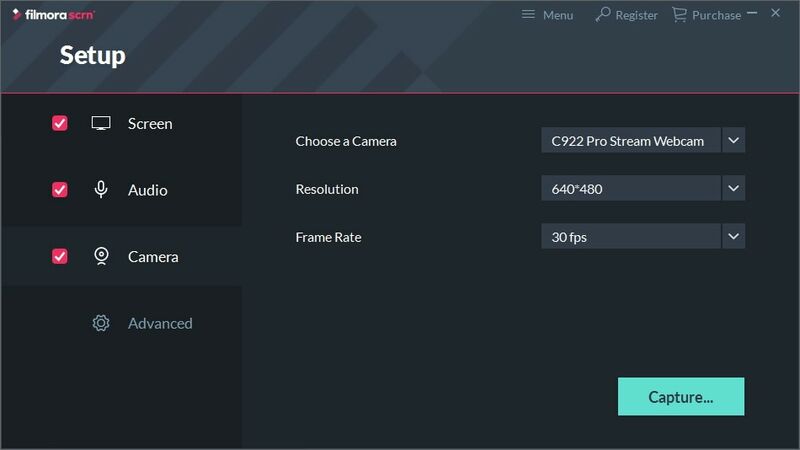 Besides the fact that Filmora Scrn can capture videos at 120 fps, it also enables you to adjust the video recording settings before each and every webcam or screen capturing session. In addition, the software's video editing mode lets you cut or trim video clips, add music or separate the audio from the video file. Filmora Scrn enables you to control the playback speed of your webcam videos or create smooth transitions between two shots. The Picture in Picture option can be utilized to create stunning YouTube videos that feature both the actions you performed on your desktop as well as the footage from a webcam. Setting up a PIP video is a rather simple process that only requires you select whether or not you want to capture a screen and the webcam footage simultaneously. The options Filmora Scrn offers are more than enough for basic webcam video recording and editing, so let’s know if it works for you in the comment below. Despite being one of the best screen and webcam recorders on the market, the video editing options Filmora Scrn offers still lack the depth of more advanced video editing software products. Wondershare's Filmora video editor is a much better option than Filmora Scrn if you would like to edit your videos professionally before posting them online. Opting for this software product will enable you to remove background noise from audio files, choose from hundreds of visual effects, produce Chroma Key videos, among other things. Using Filmora to edit webcam videos can be helpful to webcam video makers from entirely different niches. This software is equally useful to users who want to create a tutorial or a business presentation and gamers who just want to brush up their gameplay videos before posting them online. This software lets you record voiceover after the webcam recording session is over, which means that it can be used to create voiceovers that don't contain any of the common mistakes. Filmora's audio editing features are as powerful as its video editing options, while its rich royalty -free music library can be used to create a perfect soundtrack for a webcam video. The post-production process is always time consuming, but if you purchase Filmora Scrn or Fiilmora you'll be able to save time by exporting the video file directly to the video sharing platform of your choice. Both software products let its users choose whether they want to post a video on YouTube, Facebook or Vimeo. Each software lets you choose from a number of popular video file formats and allows you to select the resolution of the file you're exporting. But please be noted that there are some length limit or size limit when upload recorded webcam videos. For example, by default, YouTube allows you to upload videos which are up to 15 minutes’ long and the maximum file size is 128GB. If you want to upload longer videos, you may need to verify your account before uploading. In order to share a webcam video to any of the online platforms, we mentioned in this article you simply have to click on the Export button, select the platform to which you'd like to upload your video and adjust the export settings. Webcam videos can be used for a wide array of business and entertainment purposes, but regardless of the reason why you are producing a video, it is still important to do everything in your power to create a high-quality video. Carefully choosing a webcam as well as the video recording and editing software is essential if you want to make sure that your webcam videos meet the highest standards. Let us know which webcam you like to use the most in the comments section, and make sure to hit share and let your friends and colleagues know how easy it is to record and edit webcam videos with Filmora Scrn and Filmora.